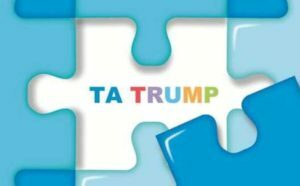 The Appeal Board of Japan Patent Office (JPO) admitted registration of a mark consisting of jigsaw puzzles design and “TA TRUMP” (see below), saying that it does not violate personality rights of Mr. Donald John Trump, the President of the United States. 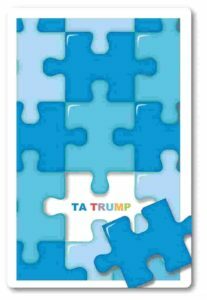 A Japanese individual filed a trademark application for the mark consisting of jigsaw puzzles design and a word of “TA TRUMP” (see below) on November 23, 2016 by designating “psychology education cards” in class 16. JPO examiner refused the mark on the grounds that it comprises a famous abbreviation of Mr. Donald John Trump, the President of the United States and presumably the applicant would not obtain consent from him. Article 4(1)(viii) of the Trademark Law prohibits registration of trademarks which contain the representation or name of any person, famous pseudonym, professional name or pen name of another person, or famous abbreviation thereof. Notwithstanding the provision, the article is not applicable where the applicant of disputed mark produces the written consent of the person. The Supreme Court of Japan ruled the article has aimed to protect personality rights of a living individual. A diminutive of foreign celebrity falls under the category of “abbreviation” even if his/her full name is not so familiar among Japanese citizen. To contest the refusal, the applicant filed an appeal on August 11, 2017. “TRUMP” has been known as an English term meaning playing cards among the public in Japan. In the meantime, “TRUMP” admittedly corresponds to a surname of Mr. Donald John Trump and it becomes evident he is a well-known person as the 45th President of the United States to be called “President Trump”. Overall appearance of the applied mark easily reminds us of a kind of playing card back designs. If so, the term of “TRUMP” depicted in the mark shall not be considered to suggest President Trump at all. Based on the foregoing, accordingly it is groundless to refuse the mark based on Article 4(1)(viii). Posted on 2018年3月18日 by Masaki MIKAMI in abbreviation, alphabetical name, Article 4(1)(viii), Composite mark, examination and tagged abbreviation, Article 4(1)(viii), DONALD TRUMP, Trademark appeal, US PRESIDENT. Disputed mark was filed on October 16, 2015 in the name of ECCENTRIC SRL, an Italian legal entity, by designating following goods in Class 24 and 25. On December 9, 2016, JPO examiner refused the mark based on Article 4(1)(viii) of the Trademark Law. Article 4(1)(viii) is a provision to prohibit registration of trademarks which contain the representation or name of any person, famous pseudonym, professional name or pen name of another person, or famous abbreviation thereof. Notwithstanding the provision, the article is not applicable where the applicant of disputed mark produces the written consent of the person. The Supreme Court of Japan has ruled the article shall be interpreted to protect personal rights of a living individual. In line with the Supreme Court ruling, Trademark Examination Manuals (TEM) set forth that the article is applicable not only to natural persons (including foreigners) and corporations but also associations without capacity. Familiar name of foreigners falls under the category of “abbreviation” if its full name contains middle name(s) unknown to Japanese consumer. Click here to access TEM on the JPO website. 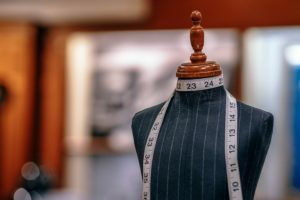 Finding that disputed mark just consists of an individual name of famous fashion designer, Romeo Gigli, the examiner raised an objection based on Article 4(1)(viii) unless ECCENTRIC SRL obtains a consent from the designer. The applicant filed a notice of appeal with the Appeal Board, a body within JPO responsible for hearing and deciding certain kinds of cases including appeals from decisions by JPO Examiners denying registration of marks, on March 9, 2017 and contended against the refusal decision by examiner. During the appeal trial, ECCENTRIC SRL argued inadequacy of the decision by demonstrating following facts. ECCENTRIC SRL is a legitimate successor of trademark rights owned by Romeo Gigli as a consequence of mandatory handover resulting from bankruptcy of company managed by Romeo Gigli irrespective of his intention. Under the circumstance, it is almost impossible to obtain a written consent from him. In the meantime, ECCENTRIC SRL has already obtained trademark registrations for the word mark “ROMEO GIGLI” in several jurisdictions. Besides, ECCENTRIC SRL is a current registrant of Japanese TM registration no. 2061302 for identical wordmark in Class 4,18,21 and 26. There has been no single complaint from consumers, traders or Romeo Gigli in person. ECCENTRIC SRL alleged that the above facts shall amount to having obtained an implicit consent from Romeo Gigli in fact. Thus, disputed mark shall be allowed for registration even without a written consent in the context of purpose of the article. 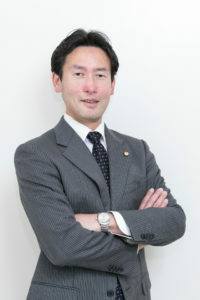 The Appeal Board dismissed the appeal, however, and sustained the examiner’s decision by saying that trademark registrations in foreign countries shall not be a decisive factor in determining registrability of disputed mark under Article 4(1)(viii) in Japan. Absence of complaint from Romeo Gigli shall not be construed that he has consented to register his name in the territory of Japan explicitly or implicitly. Unless applicant produces evidence regarding a consent from Romeo Gigli otherwise, disputed mark shall be refused to register based on Article 4(1)(viii) of the Trademark Law. According to the JPO database, ECCENTRIC SRL filed an appeal against the Board decision to the IP High Court in November 2017. The Court decision will be rendered within a couple of months. Posted on 2018年1月20日 by Masaki MIKAMI in abbreviation, alphabetical name, Article 4(1)(viii), examination, Famous mark and tagged Article 4(1)(viii), ECCENTRIC SRL, IP High Court, ROMEO GIGLI, Supreme Court. Trademark containing the name, famous pseudonym, professional name or pen name of another person in-life, or famous abbreviation thereof is prevented from registering based on Article 4(1)(viii) of the Japanese Trademark Law. Article 4(1)(viii) is applicable only to a person in-life, however. What happens to the name of a deceased historical person? JPO admitted to register the following surname of historical person as trademark filed during the past half decade by an entity apparently unrelated to the person or his descendant. Trademark Examination Manual (TEM) 42.107.04 revised in 2009 refers to approach to application filed for registering a trademark created after the name of a historical person or name of a well-known or famous deceased person. 6) Relationship between the historical person and the applicant. 2. In the process of the examination said above, especially when examiners recognize the application as “an application for registering the trademark filed by the applicant who takes advantage of the measures for public interest using the name of a historical person, who hinders the execution of the measures, and who intends to monopolize the interest while he/she knows that the application would result in damaging public interest,” the application falls under Article 4(1)(vii) of the Trademark Act based on the idea that the application may disrupt the order of fair competition and cause damage to social and public interest. To sum up, since 2009, it becomes evident that where an applied mark corresponds to the name of a historical person, the mark shall not be registered if its registration is likely to cause damage to public policy on the ground of violation of Article 4(1)(vii) and TEM 42.107.04. Inter alia, where a specific organization manages IP right of historical person, JPO will refuse registration of the name of such person accordingly. Posted on 2016年9月25日 by Masaki MIKAMI in Article 4(1)(viii) and tagged Article 4(1)(viii), deceased person, historical person.